Draw or create a piece of art of your villager, vote for the entries you think are the most stunning, and behold the winners! Fur Idol starts new rounds on the 1st and the 15th of each month. 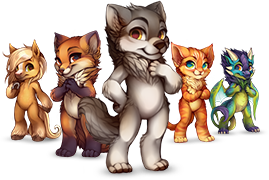 Themed Fur Idol rounds may be hosted through the forums by the Staff. Breaking any of the Fur Idol rules will result in a warning. Repeated offenses will result in a ban from Fur Idol. The time of the ban depends on the severity of the rule being broken. All Site Rules apply to Fur Idol entries as well, these are additional rules for Fur Idol. Please note entries must be a PNG file that is 1280px or less in both width and height. 1) Artists may only enter art that they themselves have drawn or created from scratch. This covers traditional and digital art. 2) Artists may not enter art that they themselves have not drawn or created from scratch. 3) Entrants may not pay for votes. You may not bribe others for votes (ie. offering any free items or currency for votes, offering any type of compensation for votes). 4) Entrants may not re-enter art pieces. Art pieces that have already been submitted to Fur Idol before may not be submitted again, regardless if it won the contest or not. 5) Threads advertising your current entries are not allowed. Threads discussing the current round of Fur Idol is allowed, but don’t make any threads with the intention of only advertising your entries. The thread must have discussion value. 6) Signatures advertising your Fur Idol entries is allowed. Advertising your Fur Idol entries through your signature is allowed lest you do not ask for votes. 7) Efforts to cheat the system will not be tolerated. 8) Entries must match the villager’s current looks and species. The villager in the art piece must be the same as the villager it’s submitted for. 9) Fur Idol is a PG-13 contest.